This flick's immediacy will play perfectly on the small screen with zero loss of tension. Great rental. The unnerving concept behind the almost riveting real-time urban thriller "Phone Booth" is chilling and inspired in its simplicity: An unseen sniper calls a pay phone and threatens to kill the man who answers if he dares to hang up. It's the kind of idea Alfred Hitchcock could have spun into cinematic gold. But in the hands of high-gloss director Joel Schumacher ("Bad Company," "Batman and Robin") the film's intelligence and creativity have to fight for screen time with invasive popcorn-movie superficiality. Although the story takes place almost entirely within an old glass-box telephone booth at 54th St. and 8th Ave. in Manhattan, "Phone Booth" opens in outer space with a superfluous shot of a communications satellite. A zoom in on the Earth follows, passing down through the clouds until it reaches the pay phone in question while a "Twilight Zone"-like narrator invites us to "meet the man who will be the final occupant of that booth." 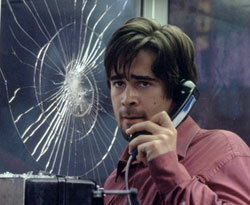 Current Hollywood It-Boy Colin Farrell ("The Recruit," "Minority Report") plays Stu Sheperd, a cocky snake of a hot young publicist who takes a break from two-faced cellular schmoozing once a day to stop at this booth, so he can make undocumented calls to a pretty actress/waitress (Katie Holmes) that he's stringing along professionally in the hopes of seducing her personally. But some psychotic stranger -- a sharp-shooting social vigilante with a loathing of corrupt souls and the calm, ominous, surround-sound-enhanced voice of Kiefer Sutherland -- knows Stu's routine. On this day, the phone in the booth rings just as Stu hangs up with the girl, and when he answers it, he finds himself trapped in a nightmare that he can't escape with his habitual, self-serving slick talk. Soon a bystander is dead and Stu is framed for it from afar but frozen on the spot lest he meet the same fate. Dozens of cops with itchy trigger fingers have arrived. So have several live TV crews, and Holmes, and Stu's wife (Rhada Mitchell). That's when the sniper tells his captive to start confessing his sins to the whole world, and not to reveal he's doing it under duress -- or else. Definitively swaggering and shifty, Farrell shows why he's earned comparisons to Tom Cruise (looks, charm, ego and enough talent to surprise detractors from time to time) and tops off this challenging performance with a tormenting and humbling psychological breakdown. He is upstaged, however, by Sutherland's perfectly menacing disembodied voice. It's a little distracting at first to hear him speak in reverberating, resounding 5.1 Dolby clarity that no telephone could ever provide. But boy does the effect make for some hair-raising tension. Despite an even more distracting, omni-present electronica score by Harry Gregson-Williams ("Armageddon," "Enemy of the State," "Spy Game"), Schumacher maintains a precision grasp on the anxiety level throughout most of the film. He lends the script (by Larry Cohen) a kinetic kind of energy by using picture-in-picture techniques to stay with Farrell in the booth while simultaneously peeking through the sniper's rifle scope and/or follow police captain Forest Whitaker (in a strong but subtle performance) as he pieces together that there's more to this stand-off than meets the eye. If only Schumacher had resisted a barrage of script-doctor contrivances (like the satellite sequence) that begin to infest the movie, "Phone Booth" could have been unforgettably gripping instead of just momentarily mesmerizing. Ranging from the forgivably illogical (why post SWAT sharpshooters on rooftops when a dozen cops already have Stu clearly in their sites?) to the insultingly hackneyed (a slasher-movie-like it's-not-over-yet epilogue), such machinations show that even when working with a novel idea and a small budget, the director still can't shake his ingrained Hollywood hokum instincts.